Post Race, originally uploaded by Jason Archer. 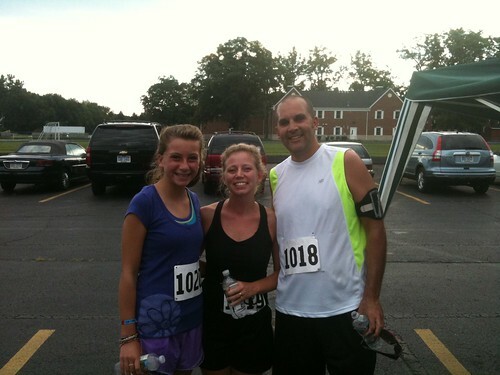 Our family united to train and finish the “Free to Run” 5k. It was an event put on by the SAFMC youth group in partnership with Not For Sale to raise money and awareness of human trafficking. Saturday I hit another milestone. I ran for 1 hour, 22 minutes. 7.5 miles. It was my best run ever. I felt like I could have run another mile at least. Definitely not a “runners high”, but a great feeling of satisfaction. With Joel and Nathan not able to run, I was wondering mentally how I would be able to make it that far. Mick said she’d ride by my side on her bike. We bribed Grace to come too. It was an amazing run. I wound up doing the entire 7.5. As we were headed toward the house, we were at 6.5. I told Grace she could just head in if she wanted to. I would run the last mile alone. She booked it into the garage. Then I saw something surprising. She started running out of the garage. Toward me. Grace ran most of the last mile. By my side. Micki faithfully rode her bike by me. Encouragement on top of encouragement. It was awesome. And we were doing it together. It was a day where I felt full. It’s interesting how I’m learning about Jesus during this thing. The idea that I’m not created to do this alone. I can’t. I may be able to run a mile. But not much more. When Mick and Grace were riding in front of me, I found myself running farther. I wonder if that’s what an authentic Christian life looks like. Running together. We weren’t created to do it on our own. At least I wasn’t. And the feeling I had at the end of this run was priceless. You can catch the intensity after the hard-core athletic Archers took care of their business. Together. The past two/three weeks have been very hectic. I’m working my job, taking a class for my Master’s, building a Web site on the side, making several video projects as “special surprises”, and helping build a Habitat for Humanity house in Jackson. 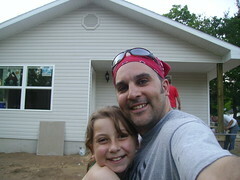 We did a Habitat House three years ago, but I wasn’t as involved as this year. I’ve spent quite a few hours working on this house for CJ and Amber and their three kids. Some pics I’ve posted. The greatest reward for me is simply doing something for someone I don’t know with no benefit for myself. It’s really funny how when we decide to make our lives not about ourselves that at that point, life really begins. It’s hard for me. But working at this house has helped me really see the beauty in giving myself away. I’ve wanted to participate with Micki and Grace on this, but really have been on my own. Building the last two weeks of school are bad. But I did get to take Grace with me last week. And she was awesome. We filled in nail holes in the trim together, cleaned, and then we hung kitchen cabinets. Grace was a great helper. Wanting to engage as much as she could. And having a great heart about it. I love when her heart gears toward others. When she gets focused there, she’s pretty amazing. I wish we could have spent more time together working on it. I took some pics before we left after a hard working night. A night spent on others. A night well spent.